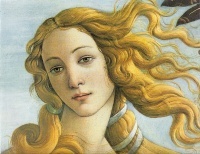 The Venus Pudica (modest Venus) type is a pose in Western art, perhaps best-known through its depiction in The Birth of Venus by Sandro Botticelli. The pose depicts a Venus usually covering her breasts with her right hand, and her groin with her left hand. The name pudica refers to Latin pudor, meaning a sense of modesty or shame. The first Venus Pudica is the sculpture Aphrodite of Cnidus (although she does not cover her breasts). Variants of the Venus Pudica (suggesting an action to cover the breasts) are the Venus de' Medici or the Capitoline Venus. Eve is usually depicted as a Venus Pudica, such as in Prudence in the pulpit of the Siena Cathedral by Giovanni Pisano. Unless indicated otherwise, the text in this article is either based on Wikipedia article "Venus Pudica" or another language Wikipedia page thereof used under the terms of the GNU Free Documentation License; or on original research by Jahsonic and friends. See Art and Popular Culture's copyright notice. This page was last modified 11:58, 16 December 2017. This page has been accessed 5,446 times.